Most people looking for a shared home in Brisbane tend to limit their searches to just a handful of suburbs that ring the city centre. And while the Valley, City and South Bank all offer great lifestyles, they also come with hefty prices and intense competition. At the time of writing the average private room in the Brisbane CBD cost $287 per week, approximately 48% more than the average room across the city. So if you’re looking for a place, be sure to keep your options open and don’t be afraid to explore those suburbs that ‘no one rates’. Sometimes a suburb just a little further out can offer just as much, for less. This quiet north-side suburb is often overlooked for its over-developed, over-crowded neighbour, Nundah. Yet with room prices 15% cheaper and half the competition than the aforementioned, Northgate is actually the better choice. The suburb also sits at the join of the Sunshine Coast and Shorncliffe train lines, which makes travel to the city and further north super convenient. It’s also a great suburb for those who drive, with ample street parking and easy access to Toombul and Sandgate roads. While the suburb may be lacking on the hospitality front, Nundah is just a short drive or stroll, which means you won’t have to venture too far for Sunday brunch. Arguably the forgotten suburb of the inner-city, Petrie Terrace sees just one person looking per room listed—compared with Fortitude Valley and Brisbane City, which see seven to one and nine to one, respectively. This despite Petrie Terrace being located just 20-minutes walk to the centre of the city or Central Station. Rooms in the suburb are also dirt cheap when compared to its neighbours, with the average room rent at $202 per week, 22% less than Spring Hill and a whopping 42% less than the City. Home to a multitude of pubs, clubs and restaurants, Petrie Terrace serves up plenty for those who like to be social. It also offers quick access to Roma Street Parklands, the river and South Bank for those outdoorsy types. Wedged between Windsor and Newmarket, Wilston is a leafy north-side suburb with a quaint village feel. Although popular with buyers, the suburb tends to be over-looked by many sharers with the suburb only seeing half the number of searches in July and August of its neighbour, Windsor—despite Wilston being 10% cheaper. The commute is also easy, with a direct train line linking the suburb to the city. It’s also a pleasant walk to the nearby Royal Brisbane and Women’s Hospital. On the social side, a cluster of funky cafes and decent restaurants make Wilston the perfect place to hangout on the weekend. There are a number of suburbs in Brisbane’s south-west that could easily qualify for this list. However, with its burgeoning cafe scene (think Billykart and Little Clives), good transport links and proximity to the city, Annerley stands out from the rest. It’s also cheap, with the average weekly room rent at just $181—13% cheaper than Woolloongabba situated two train stops closer to the city. Although the suburb has no designated train station, those of Fairfield and Dutton Park are walking distance from most parts. Alternatively, frequent buses run to the city and further south. 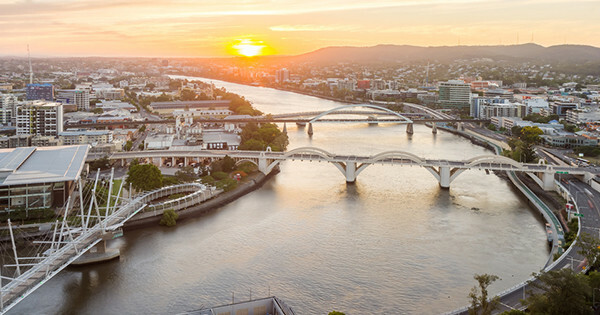 Adjacent to the well-heeled suburbs of Bulimba and Hawthorne, Morningside strikes a good balance between affordable living and proximity to the city. Handily, competition for rooms in the suburb is around a third of Bulimba, while prices approximately seven per cent less. Direct trains and plenty of buses make the commute to the city super simple, while those with wheels will find ample street parking and quick access to both the city and Gateway. Fashionable eateries are slowly making their way to the suburb, and the current offering should keep most residents happy. If not, Oxford St in Bulimba is just a few minutes away. It’s a little hard to believe Bardon is just 6.5 km from the city centre, given that the suburb feels a million miles from anything. With Mount Coo-tha to the west, bushland to the north and parklands to the south the suburb is fairly insulated from the city and suburbs around it. Transport out of the suburb can be a little light, with only a few bus routes connecting Bardon to the city and beyond. Rooms, however, are pretty reasonable with an average weekly rent of just $190—a few dollars less than the city average.